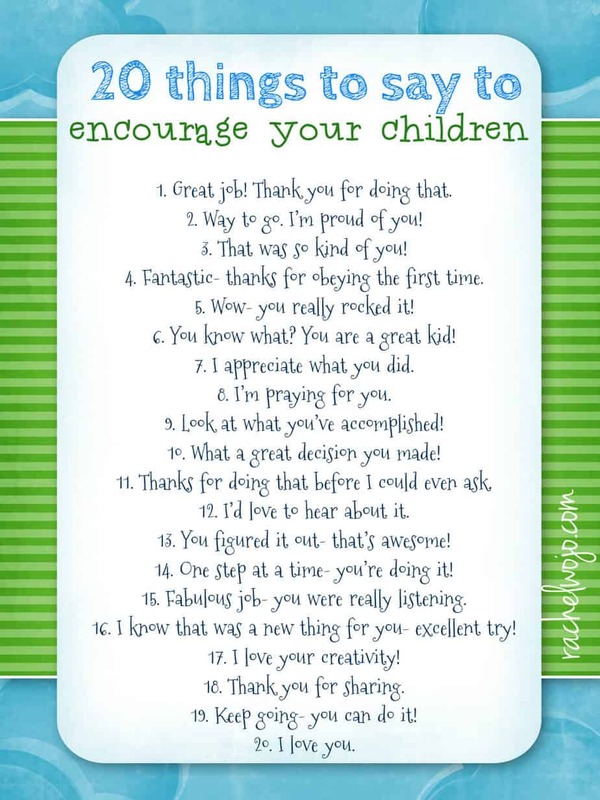 Today I’m providing the Encourage Your Children printable to accompany the 20 Things to Say to Encourage Your Children list. My prayer is that we will all use these printables to choose words wisely and be a positive encouragement and reinforcement for our families. Click on the graphic or here to open the .PDF to print. Enjoy! I would love it if you would send a pic of how you use yours! You can send as a message through our Facebook page or simply email to rachel (at) rachelwojo (dot) com. We now have a printable for each article of the 20 Things to Say to Encourage series- husband, wife and children. Be sure to check them all out in Printables! I love this website it’s giving me some awesome techniques and bible verses I’m so excited to get started on a jornaul of all your awesome ideas!